Symbolise your love with this breathtaking eternity band, crafted in traditionally elegant 18ct gold and channel set with sparkling diamonds totalling 1ct. A beautiful piece for your someone special, designed to be cherished for a lifetime. 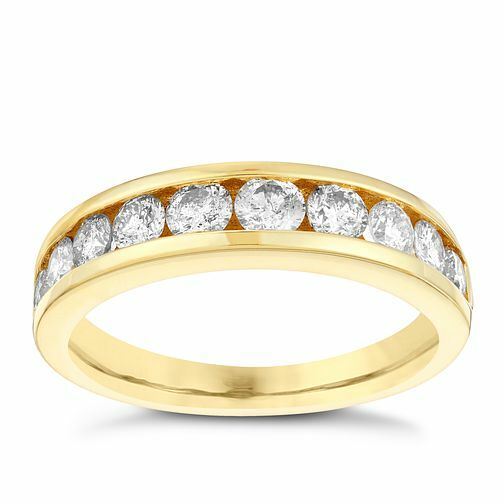 18ct gold 1ct diamond eternity ring is rated 5.0 out of 5 by 2. Rated 5 out of 5 by Anonymous from Beautiful diamonds, much bigger than expected Beautiful ring. Good quality diamonds, much bigger than expected. Ordered online - great service, fast delivery. I buy all of my diamonds from Ernest Jones and I am never disappointed. Thanks!